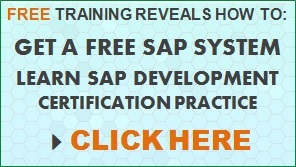 You are here: Home › SAP Training – Blog › How Do SAP ABAP Selection Screens Works? For selection screens to be built and used in a program, the first things to understand are events. Events are processing blocks, sections of code specific to the selection screens. The structure of an event starts with the event keyword, but does not have an ending keyword. The end of the event block of code is implicit, because the beginning of the next event will terminate the first, or the code itself will end. When executable programs are run, they are controlled by a predefined process in the runtime environment, and a series of processes are called one after another. These processes trigger events, for which event blocks can be defined within the program. When a program starts, certain events work in a certain order. 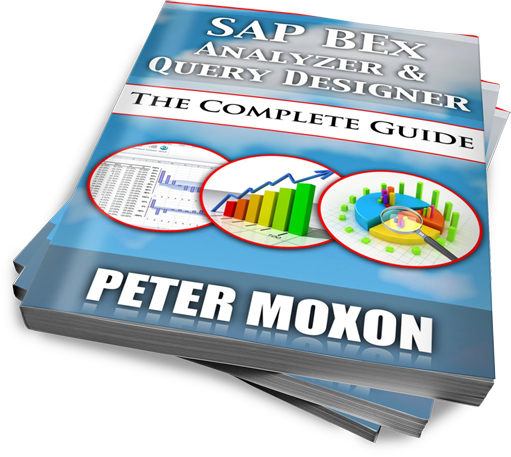 At the top level is the SAP Presentation Server (Usually the SAP GUI), seen by the end user, with its selection screen and list output. When a program starts, from the left, with the declaration of global variables, the system will check to see if any processing blocks are included and will follow the sequence of events detailed above to execute these. The initialization event block of code will only be run once, and will include things like the setting up of initial values for fields in the selection screen. It will then check whether a selection screen is included in the program. If at least one input field is present, control will be passed to the selection screen processor. This will display the screen to the user, and it can then be interacted with. Once this is complete, the ‘at selection screen’ event block will process the information, and this is where one can write code to check the entries which have been made. If incorrect values have been entered, the code can catch these and can force the selection screen to be displayed again until correct values are entered. Error messages can be included so that the user then knows where corrections must be made. The ‘start of selection’ event block then takes control once the selection screen is filled correctly. This can contain code for, for example, setting up the values of internal tables or fields. There are other event blocks, which are visible in the diagram and there could be a number of others. The ones discussed here though, tend to be the main ones which would be used when working with selection screens to capture user input, which will then be used to process the rest of the program. Once all of these event blocks have been processed, control is handed to the list processor, which will output the report to the screen for the user to see. The list screen occasionally can be interactive itself, and the code in the event block ‘at line selection’ visible in the diagram takes responsibility for this. This article will focus on creating the selection screen and making sure the user enters the correct values for the report, as well as ensuring the selection screen has a good interface. We will focus on reproduced this type of screen for use by our programs. 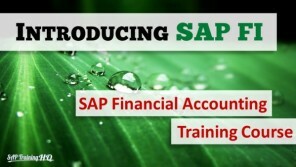 These will allow the user to select data which will be used as parameters in the program. When one creates a selection screen, in fact a dialogue screen is being created, but one does not have to write the dynpro code oneself. 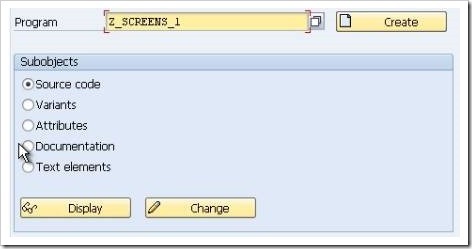 Only specific statements need to be used, and the system will take care of the screen flow logic itself. List screens and selection screens are both dialogue programs. Every one of these has at least one dynpro which is held in what is called a module pool. A dynpro report program called ‘standard selection screen’ is called and controlled automatically by the runtime environment while the program is executed. The dynpro number itself is 1000. 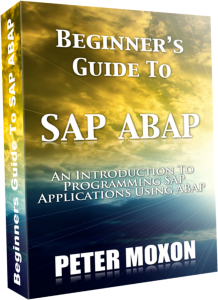 The user will only see the screen when the programmer includes the parameters in their program using specific ABAP statements. 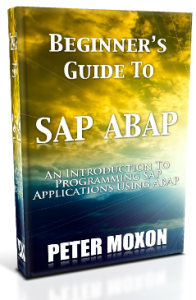 It is these ABAP statements which cause the screen to be generated and displayed to the user. This means it is easy for the programmer to start writing their own programs without having to think about code to control the screen. 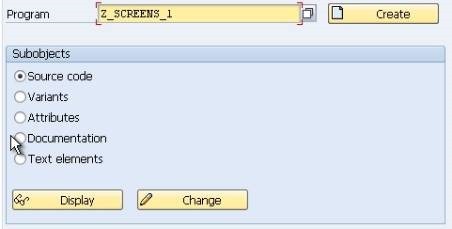 Create a brand new program in the ABAP editor, called Z_SCREENS_1. First, the initialization event will be looked at. This is the first thing to be triggered in a program. 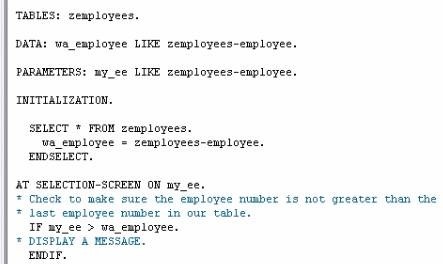 In this example, imagine one wanted to know the last employee number which was used to create a record in the zemployees table. The initialization event is the correct place for this type of code, so that this information can then be displayed on the selection screen, alerting the user that values greater than this should not be entered as they will not return results. 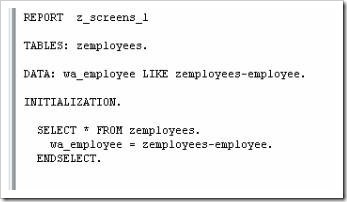 Begin by declaring the TABLES statement for zemployees. 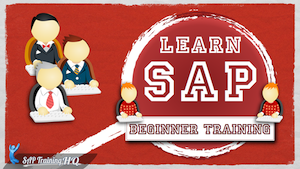 Then declare a DATA statement to hold the value of the last employee number that has been used in the table. This can be done with a work area declared LIKE the employee number field of the table. Then add a WRITE statement for the work area to output to the screen after the loop. 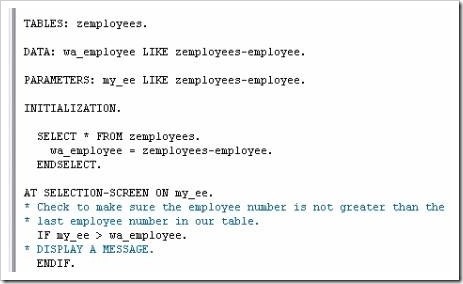 Note that as the SELECT statement is a loop and does not contain a WRITE statement inside it, the WRITE statement at the end only writes the final employee number which populates wa_employee, the last one which was used. The “at selection screen” event is the next event block in the process. This will always be executed, if present, before the report can be processed. This, then, would be the ideal place to check the value which has been entered by the user as a new employee number. The entry screen will be looked at later, but here some code will be written which will allow some kind of error message to be shown if an incorrect value is entered, telling the user to correct their entry. The PARAMETERS statement will be used, though will not be gone in detail until later. This statement, allows you to declare a parameter input box which will appear on the screen. 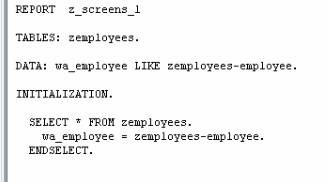 This works similarly to a DATA statement – “PARAMETERS: my_ee LIKE zemployees-employee.”, declaring the parameter as having the same properties as the employee number field. Then declare the AT SELECTION-SCREEN event. This is declared with the addition ON, and my_ee added. This specifies that the ‘at selection screen’ block refers specifically to this parameter. As mentioned earlier, there is no need to terminate event blocks, as they are terminated automatically when a new one begins. Hence, the INITIALIZATION block ends as soon as the AT SELECTION-SCREEN block begins. The DOB parameter takes on the same attributes as the DOB field in the table, to the extent that it will even offer a drop-down box to select a date. The my_numbr parameter is not related to another field as has been declared as an integer type parameter. Additionally, note that parameter names are limited to 8 characters. Also, just like the DATA statement, a parameter can hold any data type, with the one exception, floating point numbers. You will notice also that the parameters in the output are automatically given text labels. The name of the parameter from the program, converted to upper case is used by default. Now, some additions to the PARAMETERS statement will be examined. If you add this to the end of the statement follow by a value, the value will appear in the input box on the output screen giving a default value that the user can change if they wish. There are other additions which can be included with parameters, but these are generally the most common ones. 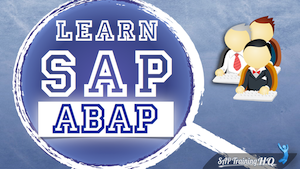 To look at others, one can simply select the PARAMETERS statement, and press F1 for the ABAP help screen, which will explain further additions which can be used. Hello Peter, thank you for this article, that’s exactly what i needed. 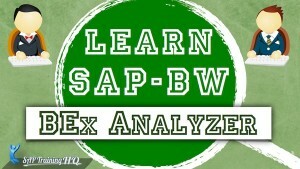 Do you think that you will post a BW training on Udemy that’s dedicated to back end?